After seasonably low water temperatures during the winter due in part to increased run-off, water temperatures are back to a point where fishing for largemouth and striped bass should take off. See a video fishing report from around this time last year with similar conditions (water temperatures peaked at 66 degrees April 9, 2018). There is a predicted 99-degree day on Friday (68-degree low at night) in Phoenix that should help kick-off some excellent fishing into the near future. 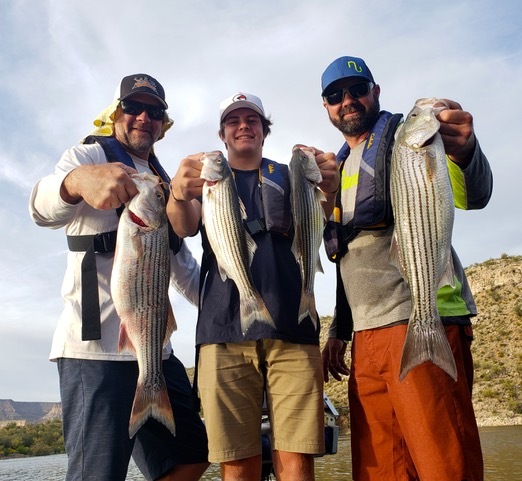 The bald eagle closure at the Agua Fria arm was lifted April 5 and anglers have been having field days in this area with largemouth and striped bass. Remember that this weekend’s full moon will not be conducive to using submersible lights at night for stripers or crappie (these underwater lights used to attract plankton-shad-game fish will only be competing with this bright moon). Largemouth bass have been in all three phases of spawn (mostly pre-spawn, according to reports) and this week’s full moon should contribute to another big wave of spawners. Barry Worman, moderator of the Arizona Striper Fishing Facebook page, recommends a few options for this week. If you have a cast net, get some shad and put a shad bait on: 1) a dropshot rig, fished right off the bottom or 2); under a slip bobber, drifting with the bait about 30 feet down. Some anglers are trolling with big equipment such as planers and downriggers, but Worman doesn’t believe that’s an efficient option.Another great option is fishing first light. During the night, many shad will have moved into shallow structures for protection, and game fish will likely come into the vicinity. Anglers can head to 20-30 feet of water at first light and target these predatory fish with spoons, paddletail swimbaits (white or pearl shad colors), Alabama rigs or Kastmaster spoons. Then, an hour after daylight, head into 40-50 feet of water and start fishing with your live shad or anchovies. Worman said other anglers have been having luck trolling deep-diving crankbaits (15-30 foot divers) in shad patterns at around 1 mph. 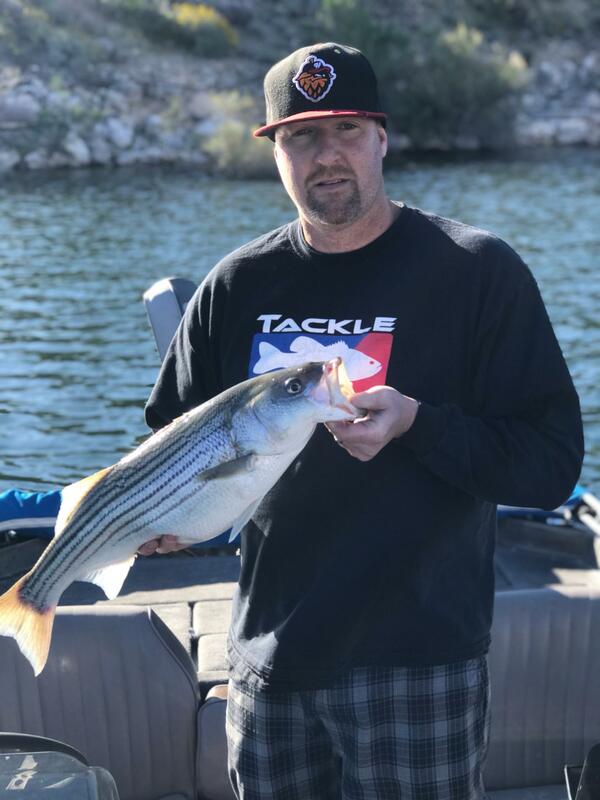 Julius Mazy of The Hook Up Outfitters reported striped bass are chasing shad, mainly around secondary points, and anglers can use Alabama rigs and small swimbaits. 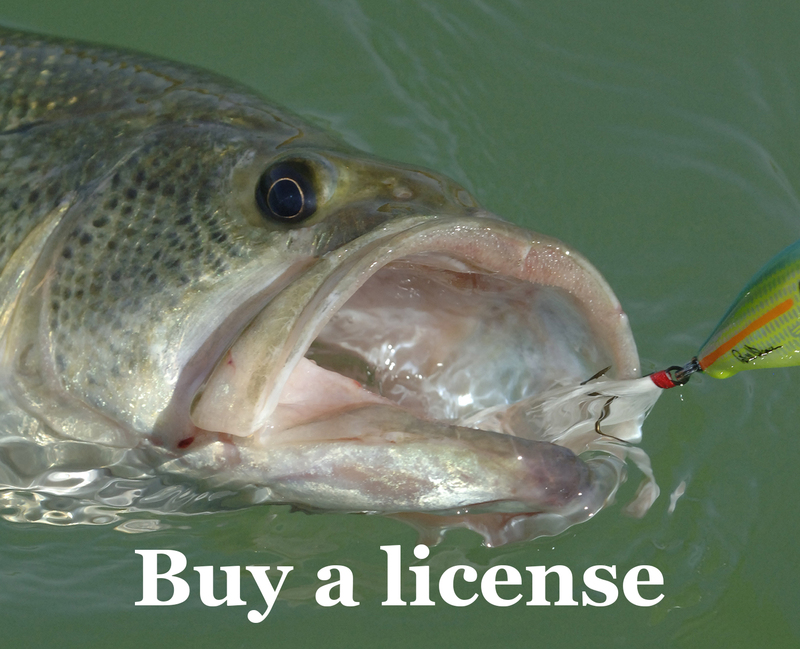 Anglers can target some of the northern coves. Many largemouth bass are in pre-spawn, he said. Anglers can target secondary points for largemouth as well with dropshot-rigged plastics, Alabama rigs. Shad have yet to move close to the banks, and the top-water bite reportedly is slow, even during early mornings. Anglers should be on the water at 5 a.m. He said crappie are biting over shallow bushes in the Agua Fria River and are scattered. Schools are few and far between. Adam L.: Pleasant is turning on, caught this 7.4-pounder off anchovies in 40 feet of water.